January is Glaucoma Awareness Month. We urge everyone to take control of their eye health and have an eye exam to help minimize the risk of developing glaucoma. When you lose vision to glaucoma, you never get it back. 10% know it's not, but that it's treatable. • 86% don't know what part of vision glaucoma affects. • 72% think glaucoma has early warning signs. The truth is that the only defence against glaucoma is early diagnosis and treatment. People who wait until something noticeable happens to their vision are too late. They have already suffered permanent vision loss. Regular eye exams are the first line of defense for early detection of glaucoma. Glaucoma is often called the silent thief of sight because it often strikes without pain or other symptoms. That's why it is critical for patients to receive a dilated eye exam from their eye doctor so that eye pressure and and the nerves in the eye can be examined for signs of glaucoma. Ethnicity affects your risk of developing glaucoma. For example, South Asians have a higher risk than Europeans of developing glaucoma. 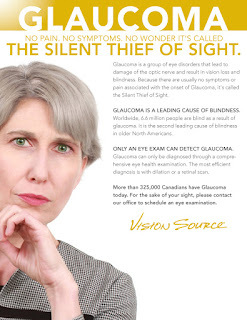 Recent studies show that Canadians are not taking basic steps (getting eye exams) to protect themseves against glaucoma. And by the time they are diagnosed, they have already lost vision that they will never get back. It does not have to be that way if you take control of your health and get regular eye exams.